With the release of IBM Lotus Sametime Connect 7.5, IBM provides an application platform upon which enhancements and application plug-ins can be built to best meet your organization's needs. Sametime Connect 7.5 is the first release of new instant messaging technology built on the Eclipse-based IBM WebSphere Everyplace Deployment platform. This new release leverages the Eclipse plug-in framework to provide developers with extensibility features that go far beyond those available in previous releases. Lotus Sametime Connect 7.5 offers more than simple instant messaging and presence features. Because it is built on Eclipse, a variety of plug-ins that expand the functionality of Lotus Sametime Connect are shipped with the product, and third parties can build additional plug-ins. 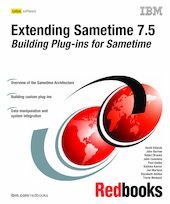 The objective of this IBM Redbooks publication is to show you how to develop Eclipse based plug-ins to customize and personalize the real-time, collaborative capabilities of Sametime within your organization. The book serves as a thorough guide on how to build plug-ins, beginning with how to install the Eclipse development environment, and then leading the reader through numerous examples ranging from a basic introduction on branding your Sametime environment, to showing how to integrate with a back-end system, retrieve information, and then manipulate the data presentation within the context of a Sametime window. For each example, we provide the audience with a step-by-step guide on how to build the plug-in. Finally, this capability for custom development represents a primary value point for Sametime 7.5. The ability to create plug-ins allows organizations to meet the growing needs of the instant messaging community. This flexibility, combined with Sametime's already proven security model and numerous user interface enhancements, makes Lotus Sametime Connect a powerful tool to help companies harness the potential of their employees.